Summer is usually my favorite season for cooking because of the abundance of fresh produce and herbs. Yes, I also love Thanksgiving and Christmas cooking, but it seems that people (at least the ones I know) are often so focused on their weight that they don't indulge in traditional holiday foods, so I can't cook as much as I'd like to. Well, I missed out on a lot of summer cooking this year because I had a beautiful baby in late-July, so now I'm getting acquainted with fall and winter foods: apples, pears, Brussels sprouts, sweet potatoes, cranberries, pork and butternut squash. I'm learning that there's plenty of tasty, fresh and even healthy food that can be prepared during the colder months. During my trip to the Finger Lakes a few weeks ago I noticed that butternut squash soup showed up on the menu at many restaurants. Over the last few years I've enjoyed butternut squash soup in restaurants and even pre-made in the grocery store. Typically, the soup isn't cheap ($6 a bowl in a decent restaurant) and there is a lot of variation in quality. Some are too thin and some don't have enough seasoning. For the past few years I've been walking by fresh butternut squash at Costco and this year I decided to just buy it and see what I could do. I can't believe how easy (and healthy) this soup is. It's now a fall staple for me and I think you'll love it, too. I started with pre-cut butternut squash. You can absolutely buy a whole squash and cut it yourself, but I got 2 pounds of pre-cut butternut squash for less than $6 at Costco. That was actually cheaper than buying the whole vegetable at most other stores. Of course, if you cut it yourself you won't really know if you have 2 pounds of squash (unless you use a kitchen scale), but that's okay. This recipe is a method... an inspiration. You can adjust the liquid and seasonings up or down to suit your squash. Saute diced onion in butter (or vegetable oil if you're keeping it vegan)... sometimes I add a little garlic, too. Add diced butternut squash. Fill your pot with just enough chicken broth (or vegetable broth if you're keeping this vegan/vegetarian) to cover the squash. Sprinkle in a little salt and pepper. Simmer the squash for 15-20 minutes. Once it's tender, blend the soup. I use an immersion blender, but you could also ladle the soup into a standard blender or food processor. The key at this point is to make sure the soup isn't too watery... see the photo above? That's how much broth you want. Check the situation before you start blending. If it's too watery, ladle some broth out. You can always add it back in. So now you have blended soup. Taste it. Add stuff to enhance it. First suggestion? A dollop of apple sauce. I also added about a tablespoon of chopped, fresh sage. In other batches I've done chives instead of sage. I've added a teaspoon of curry powder instead of sage. I've added a pinch of nutmeg. But I always add the applesauce. I know these combinations may sound exotic, but I'm telling you... it's good! 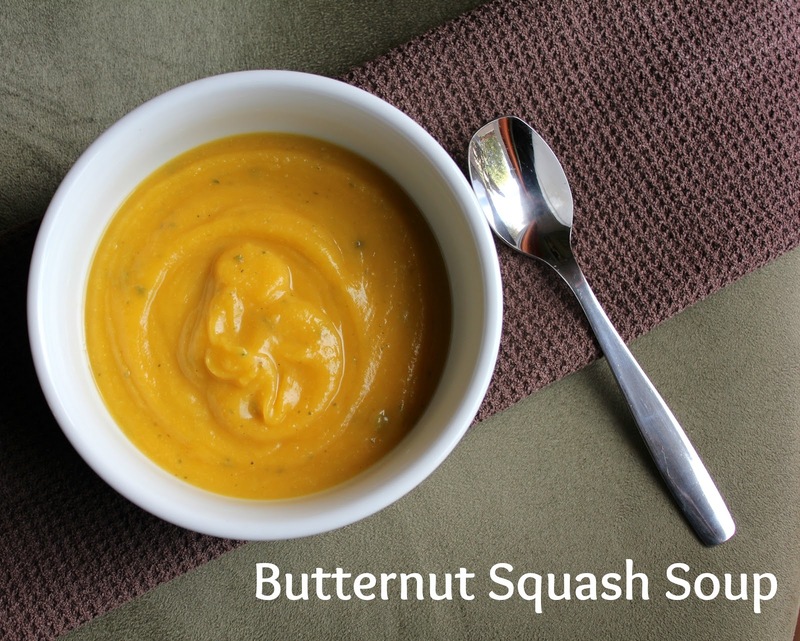 Butternut squash is naturally sweet (like a sweet potato) and naturally creamy once it's blended. This soup needs no milk or cream to take on this thick, velvety texture. It's pretty much 100% vegetables. You just season it to your liking. And there you have it! Quick, healthy and very fresh. It's fall in a bowl. It reheats very well, too. Make a batch and enjoy it for dinner one night and lunch the next day. I think you'll like this one. Melt butter over medium heat in a saucepan. Saute onions in butter until softened, about 5 minutes, stirring frequently. Add in butternut squash, salt and pepper to taste. Add enough chicken broth to just barely cover squash. Bring to a boil. Simmer, uncovered for 15-20 minutes, or until squash is fork-tender. Puree the soup. Use an immersion blender, or transfer soup to a food processor or blender. Return pureed soup to the pot. Stir in applesauce and nutmeg. Add optional seasonings if desired. Serve hot with grilled cheese or fresh, hot rolls.